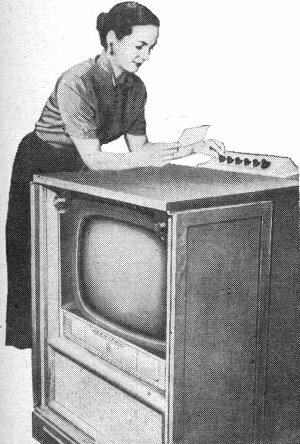 The 1950s was a time of transition in the television watching business. 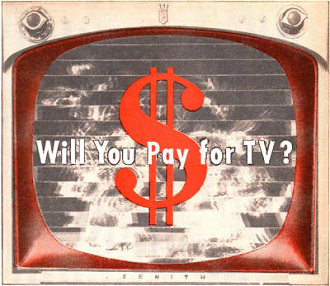 Broadcasters were experimenting with pay-TV systems to replace or supplement over-the-air service. Much as people today think that everything on the Internet should be free, the same mindset prevailed then regarding television programming. 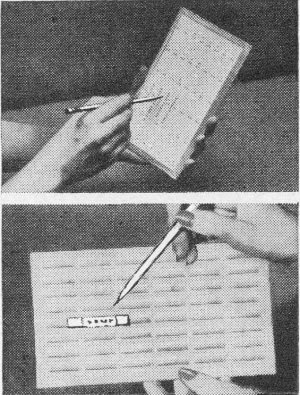 Early coding and decoding schemes seem really hokey by today's standards, using computer-type punch cards. I remember the area around Annapolis, Maryland, where I grew up, had both over-the-air and cable-based subscription services in conjunction with the open broadcasts. I spent at least a little time playing with the horizontal and vertical picture sync settings on the back of the TV set that, if lucky, would produce a stabilized picture for at least a little while since at least some of the simpler "encoding" involved inverting the standard synchronization pulses in the analog waveform. 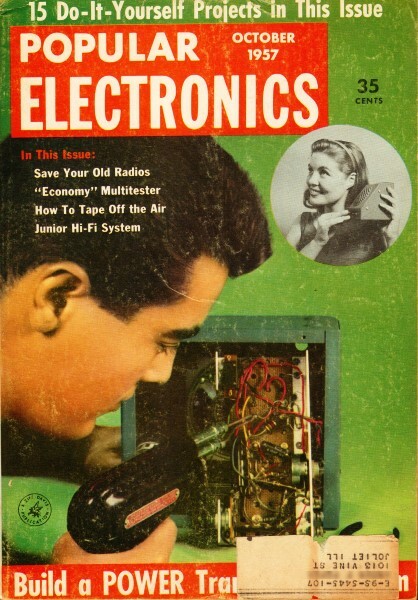 I have posted at least two other articles from the era on the same topic: "New 'Pay-As-You-Watch' System," in a 1953 Radio & Television News and "Stop Pay TV!," in a 1958 Radio-Electronics. What is this thing called pay-TV? More and more it's been in the news lately, and chances are that very soon the FCC will hand down a decision on whether to allow a public test or not. So let's examine it, take it apart and see what makes it tick. Pay-TV (or subscription television, to use the technical term) is just what the name implies - television service for which the viewer pays rather than the sponsor. Without going into the name-calling aspects of the controversy, there are powerful elements opposed to the system, and equally powerful elements in favor of it. Therefore, the FCC - which has been examining all aspects of the situation for several years - has a ticklish decision to make. The system itself can be used in two ways: broadcast transmission on one or more channels, with the viewer choosing the program he wants to see and paying for it; or closed-circuit transmission, paid for on a program basis or by a monthly flat fee. Each method has its proponents, but at the moment the FCC enters the case only in the broadcast aspect, since it has the power to regulate such transmission. It is possible that in the future the agency may rule that it has power over interstate closed-wire television also. The key to the broadcast transmission scheme, of course, is a means of preventing just anybody from receiving the programs. The three major firms in this field have all turned to coding (scrambling), which presents a problem. Basic operation of broadcast subscription TV is exactly the same as normal television. The big difference is the insertion of a scrambler step before transmission and a decoder at the receiver. If they scramble the picture and sound (they believe sound must be coded too, because they've found that people will just listen to the sound and enjoy it), there must be some way of unscrambling it. So, naturally, they will provide their customers with decoders. But there's the rub. Some people, principally the proponents of closed-circuit transmission, claim that any coded broadcast could be bootlegged (uncoded by those not paying for it) with the greatest of ease. Decoder used by Zenith has numbers set by knobs, obtained by punch-out card. Those sponsoring broadcast transmission deny it. They say that it would be an extremely difficult process and, in these prosperous times, wouldn't seem worth the work. Scrambling. First let's examine scrambling. Generally, three types would be used, individually or in random order. One is coding by line groups, in which groups of lines are shifted in relation to each other, giving a Venetian blind effect whereby each of the "slats" forming the picture is moved in relation to the next. Field coding is the second type, in which the two fields of the picture are shifted in relation to each other. The normal field results from the way the picture is "painted" on the tube. In the 525-line picture, first alternate lines are transmitted, then the lines in between, but in such rapid sequence that you "see" both fields. In coding the fields, the two sequences would be shifted out of relationship, so you would see a blurred series of images rather than a clear picture. The third form is essentially the same as the first, except that instead of coding groups of lines a single line is shifted out of phase with the next. In addition to this, inversion of polarity is used just to confuse the picture. Here white would appear to be black, and black white. When all three types are used in random order, with reversal of polarity thrown in for good measure, the result is quite definitely impossible to make out. Decoding. The coded picture, to be viewed, must be decoded. There are three decoding systems currently taking the spotlight which are ready for action. Skiatron uses a decoder which is keyed by a printed-circuit IBM-type card. The card is inserted and the viewer presses a button. The circuit is closed and the device automatically clears up the picture. At the same time, it punches the card as a record. At the end of a month, the card would be sent back, the total tallied, and the next month's card sent to the viewer. Zenith uses a decoder on which five knobs can be turned to form a series of numbers, A punch-out card provided by the firm supplies the proper number for the day in question, and would work only for that decoder. Punched holes form the basis for billing. 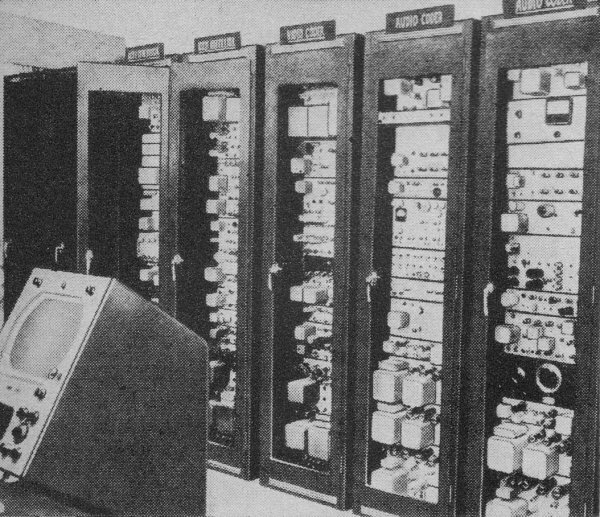 A small electronic computer is used to "devise" the numbers for each subscriber. Paramount's Phonevision, which was originally conceived as a telephone transmission operation, has since switched to broadcast, but in this case, rather than numbers and cards, a coin box is used. When the proper number of coins has been deposited, the picture will be unscrambled. If the FCC fails to approve tests of broadcast pay-TV, the industry will be forced to fall back on closed-circuit transmission. In this case, a huge wiring program would be entailed. While this might not be too costly for smaller towns and rural areas, it would involve considerable expense in metropolitan areas where telephone and utility wires are underground. On the West Coast, however, some communities - such as the city of Los Angeles - have most of their utility wires on poles above ground. This would simplify closed-wire installation to a tremendous degree. Skiatron has claimed to have developed a new light line which is inexpensive, yet would be able to carry three signals. Such a line would cut down costs tremendously. Otherwise, of course, coaxial cable would be used. Skiatron's system uses printed-circuit card inserted in decoder. Jerrold, a firm which specializes in community antenna systems, claims that closed systems are the only practicable types for subscription television, since, the company says, it is simple to devise an unscrambler which would decode any picture. Jerrold stated before the FCC that it is prepared to file for a patent on such a device. Also, this firm points out that there are scores of communities already wired for master antenna systems, and calls for FCC-sponsored tests in such an area. It adds that there would be no problem of "bootlegging" the signal, since service would be supplied by simple switching as in a telephone office. Jerrold is in the process of setting up such a system in Bartlesville, Okla., which will be run by a theater chain. Three channels will be available, one offering 13 first-run movies, another second-run pictures, and the third background music, news and time; for this entertainment package, the subscriber will pay $9.50 a month. Typical of encoding systems which will scramble picture and sound is this one used by Zenith. The monitor in front keeps continuous check on picture "quality." Although this is a rather elaborate setup, other coding installations are simpler. A closed-wire system would need no scrambling. since programs would be routed to customers by means of a switching system similar to one used for a telephone switchboard. Under both types of transmission, the programs are expected to be first-run movies, Broadway plays and musicals, sports, opera, symphonies and certain special events, as well as strictly educational programs. In some quarters this is seen as being the ruination of the movie industry, but others claim that it would be its salvation. 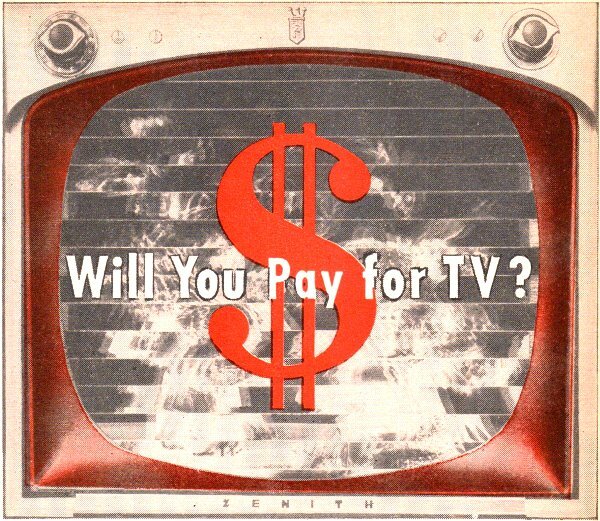 Some say that to force the public to pay for a broadcast would violate the "freedom" of the air; others point out that the public is actually paying for commercial television now through buying the products of the firms that pay for the air time. One thing is certain. In one way or another, there will be a form of pay-TV in the not-too-distant future. Whether you will be willing to pay from 25 cents to a dollar or more for such entertainment will be up to you to decide. But it will be there for you to make the choice.